We provided a six day creative dance residency for 20 adults with learning disabilities in June 2017 in Belfast. Indepen-dance is a Glasgow based inclusive dance development company, providing dance for disabled people via an annual core programme of weekly creative movement classes, quarterly training courses and performances opportunities. As we received half the funding from the original application,we organised one residency for the disabled adults who are part of our Adult Performance Company. We provided one six day creative dance residency project for 20 adults with learning disabilities. The residency dates were 11th - 16th June 2017 and took place in Belfast, Ireland. We travelled by coach and ferry arriving in our accommodation on the Sunday evening in preparation for our residency on Monday 12th June. Each day of the residency our dancers participated in a dance workshop exploring new choreographic ideas and themes for a future performance project. We were joined daily by a variety of local disabled people who wanted to meet and dance with our Adult Performance Company members. The accommodation we had selected was ideal for our group as a girl guiding centre it offered facilities to cook for our group and had plenty of space for our dancers to relax in the evening after a day of dancing together. We organised a sightseeing bus trip round Belfast City to visit the city's landmarks and on our last evening visited a local restaurant . The typical day for the disabled dancers was getting up and ready for breakfast, travel to the rehearsal venue, morning technique class and yoga followed by a creative movement and improvisation dance session. Lunch followed by another creative movement session with a number of guest disabled dancers from Artscare Belfast. Travel back to the accommodation, dinner then the option to participate in an evening leisure activity such as a walk to the beach or watching a film, card games etc. As we had more learning disabled participants than originally planned in our original funding application we required additional support staff to ensure that everyone was safe and looked after properly with a comfortable ratio of disabled participants to support staff this was dependant on the individual needs of the disabled dancers. In total we had 20 dancers with learning disabilities, 2 volunteers and 16 non disabled staff - 38 in total. The disabled participants who are currently attending our weekly classes were offered the opportunity to attend. Show Case Study Hide Case Study A difference Creative Residency made: Carers will have more opportunities to enjoy a life outside of their caring role. Indepen-dance has been providing a regular a core programme of weekly activities 43 weeks of the year for over 21 years. Some of the original members who have been using our service for a good numbers of years now have parents who are widowed and elderly. This particular type of carer has a son/daughter/relative who are members of our group of dancers. From our experience they are a group that really benefit from the break from the caring role. Our creative break allowed these parents to enjoy life outside of their caring role, giving them time to themselves and well needed rest from the day to day care they normally provide from their son and daughters, this also enables them to sustain their caring role after the cared for person returns home with a renewed energy. Show Case Study Hide Case Study A difference Creative Residency made: Carers who are less likely to ask for support will feel better supported and more aware of the sources of help. One of our disabled dancers is a young 21 year old female who has severe autism. From the evaluation gathered after the residency we have discovered that her mother has NEVER had any respite similar to this in 21 years, her mother wrote that it was a huge experience for her to have a break from the role of carer for the first time in 21 years. The mother also goes on to say that for the first time in a long time she was able to spend quality time with her other daughter. She said that as her disabled daughter doesn't sleep well she was able to catch up on sleep enabling her to recharge for her daughters return. She also commented that her daughter seemed really happy and content on her return and wrote that this is down to the wonderful support provided by Indepen-dance staff and she is extremely happy with the support her daughter was given. Show Case Study Hide Case Study A difference Creative Residency made: Carers will be better supported to sustain their caring role. Another parent who's son attended the residency wrote in the feedback form that as this was the first time her son had been away from home without both his parents she felt anxious, he is her only son and he has never been away from home before without his parents. She does mention that throughout the week she was able to "chill out" in the evenings without the normal responsibilities she would have when her son was at home. She mentioned that she'd gone out for an evening for dinner, she was able to do things by herself without having to look after her son. She also wrote that she felt this was a really good opportunity for her son to have the opportunity to experience some independence from his family and to see how he coped on his own, she said that on his return he was very proud of himself for going away and full of confidence to go away again. The Creative Breaks programme is an ideal fund to support our organisation to offer subsidised residential breaks, it's a difficult activity to source funding for as it's a short term project but we know it has long lasting benefits for the cared for person and their carers . We have been organising residential creative breaks for a number of years and some of our disabled dancers have recollected and remembered fondly the places we've visited and the people we've met. 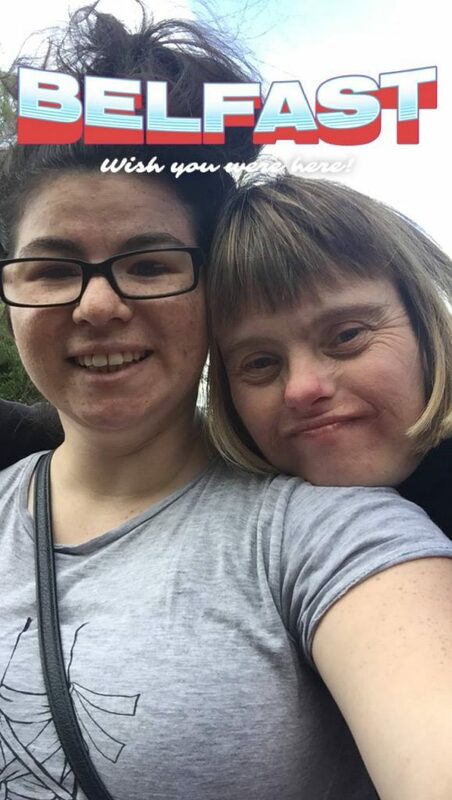 We know that it can be difficult for our client group to have the same opportunities as people without disabilities the activities and opportunities we've been able to provide for our dancers to go away together are invaluable. The service we provided was personalised for those disabled people who attend our creative movement classes, as the residency was not just about the residential experience but about sharing a creative experience (dance) with other people from the Adult Performance Company and visiting disabled dancers from Artcare Belfast. Unexpected challenges for this particular project arouse when we couldn't get a booking for the hostel that we have used twice previously for the particular dates we wanted to hold the residency, this meant a bit of research had to be carried out to find alternative accommodation for a large group circa 38 of adults with and without disabilities, 2 of whom required wheelchair accessible rooms and 1 with mobility issues. This proved to be challenging but not impossible, in the end we discovered brilliant accommodation which totally suited our needs, it was affordable and within our budget and as it had facilities to do our own cooking it made the residency more affordable and we could cater to the individuals needs. For this residency we had 5 disabled people with us who have never been on a residency before with Indepen-dance. One to one discussions where carried out with the new carers to reassure them that we would ensure their son/daughter would be cared for and we would keep in contact with them via text and phone to give updates on how their son and daughter was getting on. This is about building confidence in the carers to support them to take a break and to feel relaxed in the knowledge that their son/daughter is enjoying the creative break. 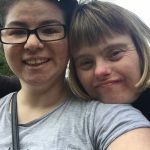 This fund is really important to our organisation, it is tailor made to fund an activity which gives the carer a break from their day to day role as well as the cared for person benefiting from a creative activity it results in the majority if not all cases in a win win situation which benefits all. It does take precise planning, organisational skills and a dedicated team to run a successful creative break and our aim is to achieve this every time. We couldn't do the activity without the support of The Short Breaks Fund Creative Breaks programme. We'd be happy to meet with other organisations to share our experience and skills and to share the details of the brilliant accessible accommodation we found in Belfast which was totally suited to our needs, this organisation also put us in touch with a bus company which were really brilliant, accommodating and affordable. Early planning and booking of accommodation is essential especially when travelling with a big group with a variety of needs. Discussions with new parents was essential to support them to build confidence to make the decision to allow the cared for person to attend the creative residency, we also organised one of the parents of a disabled dancer who had already attended a residency to speak to the new parent , this worked really well.